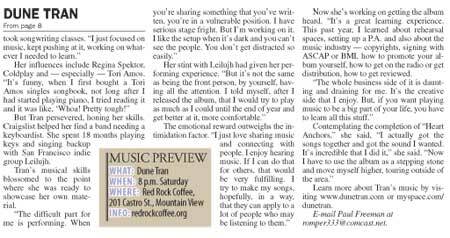 Paul Freeman from The Daily News of the Bay Area interviewed me and wrote an article on me featured in the Arts and Entertainment section of the 12/10/2009 edition. You can read it online at www.baydailynews.com. Thanks so much to Paul and The Daily News! 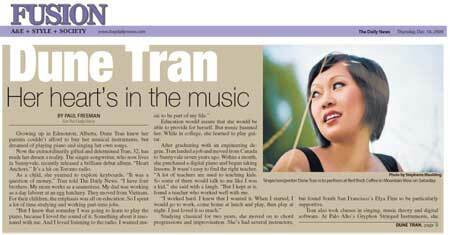 This is my first time being featured in a newspaper! I’m so excited to share this with you!! Click on the images below to view the pdf files. It came out just in time before my final show of the year at the Red Rock Coffee in Mountain View, CA 8pm. All tips and cd sales will be donated to the Second Harvest Food Bank and The Family Giving Tree. For the first time, my album “Heart Anchors” got reported in a chart at a radio station! It made it onto the Top 30 chart of CIUT Radio in Toronto, Canada for a couple weeks reaching it’s peak at number 9. I am so incredibly thrilled that they’re playing my music on their station with enough spins to put me on their top 30 chart. It’s quite exciting for me. A very amusing and enjoyable review. He also included my music in the July 10, 2009 nextbigthing podcast, wrote a poem and posted a visual manipulation of a Dune Tran Photo! Hear Silence and Safety Nets in this episode!